The colorful display of feathers common among hummingbirds has roots in a bird-like Chinese dinosaur from 161 million years ago, a new study finds. Scientists on Monday announced the discovery of a duck-sized dinosaur with shiny, multicolored feathers that lived in northeastern China during the Jurassic Period. The new species – called Caihong juji, Mandarin for “rainbow with the big crest” – is described in a study published by an international team of scientists, including Chad Eliason, a postdoctoral researcher at The Field Museum. The dinosaur’s rainbow feathers might be a prehistoric version of a peacock’s multicolored tail, one example of colorful plumage used by modern birds to attract mates. Painting a picture of the dinosaur’s feathers was not possible upon first look, however. While examining the feathers under a powerful microscope, researchers found that for the most part, the pigment that was once present was long gone. But the physical structures of the pigment-containing cells were still intact, allowing researchers to compare their shape to other species. Eventually, they matched the pancake-shaped cells from Caihong with the shapes of cells in birds alive today. The best match turned out to be hummingbirds. Birds evolved from small feathered dinosaurs from the Jurassic Period, such as Caihong. 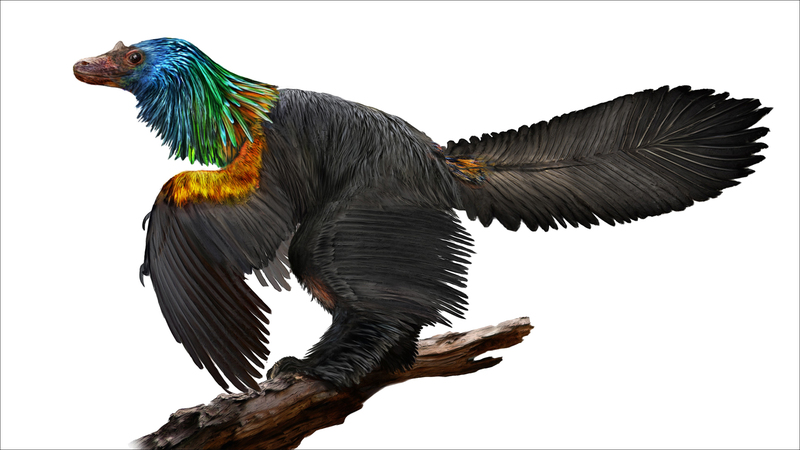 In addition to being the oldest example of a species with rainbow feathers, the newly discovered dinosaur is the earliest known animal with asymmetrical feathers, a feature that allows modern birds to steer or turn while flying. Caihong, however, could not fly. The dinosaur’s asymmetrical feathers were on its tail – as opposed to on the wingtips – and were primarily used to keep warm, the researchers found. Along with Eliason, the study was conducted by Quanguo Li of the China University of Geosciences in Beijing and Matthew D. Shawkey of the University of Ghent in Belgium. Sept. 1: Chicago’s iconic T. rex Sue will get a makeover when the largest dinosaur ever discovered comes to town. Stretching 122 feet from snout to tail, the titanosaur is longer than two accordion CTA buses end to end. May 31: A new exhibit aims to be an immersive experience that brings the 2015 movie and its gigantic reptilian stars to life.